Description: This is a shrub or small tree up to 30' tall, although it is usually less than 15' tall. Shrubs with multiple slender trunks are common, although sometimes it becomes a tree with a single short trunk up to 8" across. The branches are often irregular and crooked, forming an open crown in areas that receive less light, while in full sunlight a dense ovoid crown may develop. On a large mature trunk, the bark is slightly scaly, warty, and gray; it may have reddish brown furrows that are shallow and narrow. The bark of branches and twigs is gray and relatively smooth, while twigs are gray or brown, glabrous or short-pubescent, and covered with scattered white lenticels. Young shoots are light green, terete, and glabrous or short-pubescent. Pairs of opposite leaves occur along the twigs and young shoots. These leaves are 3-6" long, 1-3" across, and deciduous; they are elliptic to ovate in shape with margins that are entire (toothless) and revolute (folded downward and inward). 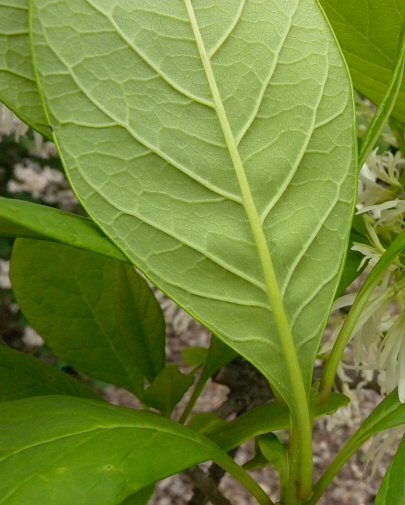 The leaf bases are wedge-shaped, while their tips are acute. The upper leaf surface is yellowish green to medium green and glabrous, while the lower leaf surface is pale green and either glabrous or short-pubescent. Leaf venation is pinnate. The petioles are light green or reddish purple, glabrous or short-pubescent, and up to ½" long. Drooping panicles of flowers up to 8" long 6" across are produced from the axils of last year's leaves. Each panicle has a tripartite branching structure that terminates in either multiple solitary flowers or multiple clusters of 2-3 flowers (usually the latter). The peduncle, intermediate stems, and pedicels of each panicle are light green to reddish purple and slender; sometimes pairs of small leafy bracts develop at the bases of divergent stems. Each flower is about 1" long, consisting of a white corolla with 4 lobes and a light green calyx with 4 teeth. The divergent lobes of the corolla are linear in shape and quite long; they are usually somewhat curved or twisted. In contrast, the calyx is very short (about 3 mm. or 1/8" in length). American Fringetree is usually dioecious, producing either all male flowers or all female flowers on the same shrub or tree, but not both. However, sometimes perfect flowers are produced. Male flowers have 2 short stamens, while female flowers have a small superior ovary with a single style. The blooming period occurs during late spring, lasting about 2 weeks. The flowers have an attractive fragrance. Afterwards, fertile female or perfect flowers are replaced by drupes that become mature during late summer. Mature drupes are ½–¾" long, ovoid in shape, and blue to nearly black; each drupe contains a thin layer of flesh that surrounds a large stone (hardened seed). The root system is woody, relatively shallow, and branching. This woody plant reproduces by reseeding itself. Cultivation: The preference is full sun to light shade, moist to dry-mesic conditions, and deep loam to thin rocky soil. This woody plant is able to adjust to climates that lie north of its natural range (at least to Zone 5). It is probably best cultivated in areas that receive some protection from prevailing winds. Range & Habitat: American Fringetree has naturalized in DuPage County as an escape from cultivation, otherwise it is not known to occur as a wild plant in Illinois (see Distribution Map). This woody plant is native to SE United States, including small areas of Kentucky and Missouri; Illinois lies north of its natural range. Outside of Illinois, habitats include upland woodlands and rocky bluffs, glades and ledges, river outcrop prairies, and wooded areas along streams. American Fringetree is often cultivated as an ornamental landscape plant. Faunal Associations: The pollinators of the flowers are widely reported to be bees, although little additional information is currently available. Steury et al. (2009) reported a cuckoo bee (Nomada maculata) as a visitor to the flowers. American Fringetree is a host plant of several insect species. 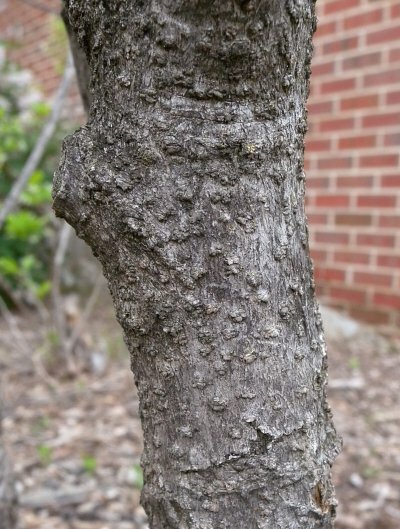 Polyphagous armored scales, including Forbes Scale (Diaspidiotus forbesi), English Walnut Scale (Diaspidotus juglansregiae), and White Peach Scale (Pseudaulacaspis pentagona), attach themselves to the bark, where they feed (ScaleNet, accessed 2014). The larvae of several moths feed on the leaves (Covell, 1984/2005), including the Fringetree Sallow (Sympistis chionanthi), Fall Webworm (Hyphantria cunea), Waved Sphinx (Ceratomia undulosa), Rustic Sphinx (Manduca rustica), and Fawn Sphinx (Sphinx kalmiae). Among vertebrate animals, the fruits of this woody plant are eaten by such birds as the Northern Cardinal, Eastern Bluebird, Brown Thrasher, Northern Mockingbird, Blue Jay, Pileated Woodpecker, and Wild Turkey, while White-tailed Deer browse on both the foliage and fruits. The stones (hardened seeds) of the fruits are sometimes eaten by small rodents. Photographic Location: On the campus of the University of Illinois in Urbana, Illinois. Comments: American Fringetree has attractive flowers, fruits, and leaves. In particular, the flowers have a very distinctive appearance. 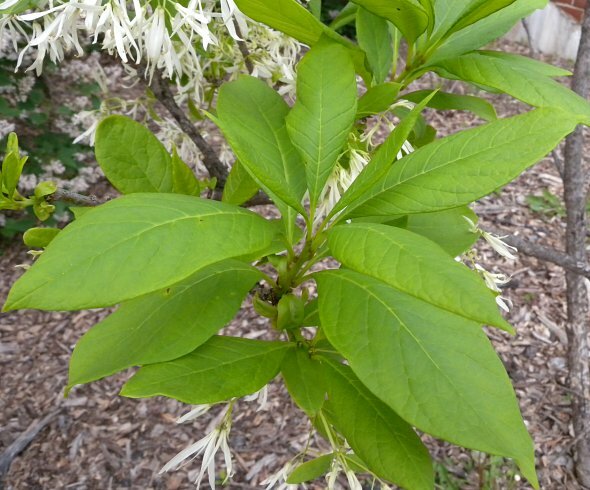 A similar species, Chinese Fringetree (Chionanthus retusus), is less often cultivated. This latter species has wider leaves with either rounded or cordate bases and the corolla lobes of its flowers are somewhat shorter than those of American Fringetree. 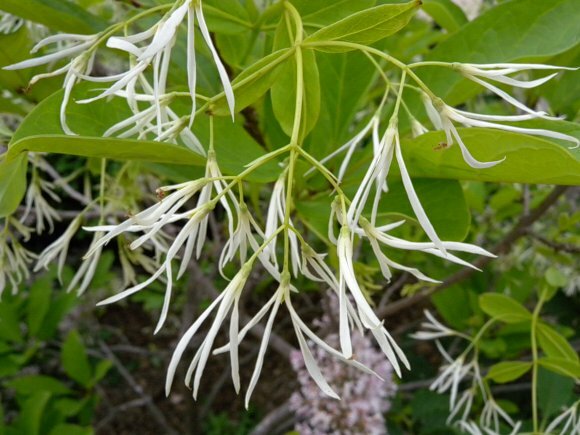 There are no records of Chinese Fringetree escaping from cultivation in Illinois, however. 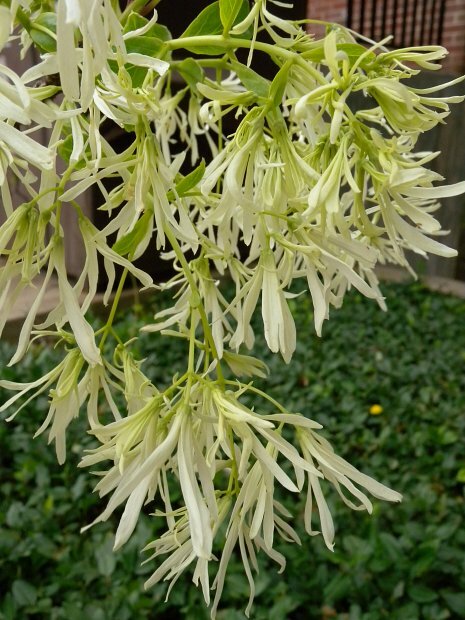 Another species that is endemic to Florida, Pygmy Fringetree (Chionanthus pygmaeus), is similar in appearance to American Fringetree, but it is smaller in size.